After an early career as a painter, photographer, and writer, Robert Bresson made his first feature film, Les Anges du Péché (Angels of the Streets) in 1943. Even with this first directorial effort, Bresson was sufficiently established with the French intelligentsia to have Jean Giraudoux work on the dialogue. With Bresson’s next film, Les Dames du Bois de Boulogne (Ladies of the Bois de Boulogne), another stellar figure, Jean Cocteau, wrote the dialogue for a script based on an episode from Denis Diderot’s Jacques le Fataliste et Son Maitre, but updated to a modern setting. The film is considered to be something of an anomaly in Bresson’s oeuvre, since it had a more or less conventional romantic narrative structure and employed professional actors. His famous cinematic style is more consistently manifested in his subsequent films, such as Diary of a Country Priest (Journal D'un Curé De Campagne, 1951) and A Man Escaped (Un Condamné à Mort s'est Échappé ou Le Vent Souffle où il Veut, 1956). The story begins with two upper-class lovers, Hélène and Jean, discussing their relationship. From the very outset, we can see that Hélène is guarded and cautious about revealing her true feelings, while Jean is a transparent and guileless personality who wears his heart on his sleeve. In an attempt to discuss their deteriorating relationship without losing face, Hélène tells Jean that her passion for him is growing cold. Jean immediately and enthusiastically responds that he feels exactly the same way, and he suggests that they set themselves free and remain “good friends”. Hélène covers her overt responses, but it is evident that she is deeply wounded by Jean’s reactions. She sets out to take her revenge. Hélène visits an old friend of high social standing from the countryside who has recently become impoverished and has moved to Paris with her beautiful daughter, Agnès. Faced with economic ruin, the daughter must now support her mother by working as a cabaret dancer and taking money for sexual favours from male patrons; but the mother and daughter are ashamed of the lives they now lead. Hélène’s goal is to shield their past from Jean and to present Agnès as woman of impeccable modesty. Hélène arranges a “chance” meeting in the Bois de Boulogne, a large Parisian park, between Jean and the two ladies, and, of course, Jean is immediately fascinated with Agnès. Hélène stage manages the subsequent interactions, and Jean is inevitably ensnared in the spider’s web of attraction. Finally he proposes marriage, and Hélène makes sure that the marriage ceremony is a gala affair with all their high-society acquaintances invited. Immediately afterwards, Hélène triumphantly announces to Jean that he has just married a tramp and has disgraced himself. Jean, dumbfounded and made a fool, asks Hélène why she did that to him. Hélène reminds him about the fury of a woman scorned. Agnès’s situation throughout all this has been ambiguous. She had been reluctant to play along with Hélène’s plot and had avoided Jean all along. But this avoidance had only inflamed Jean’s passion and had led to even more amorous gestures on his part. In the end, she had reluctantly succumbed to his entreaties and fallen in love with Jean, even knowing that her scandalous past would be revealed at some point. When the secret is finally revealed at her wedding, she suffers from complete despair and humiliation. When Jean goes to visit her after the wedding, he learns that she has suffered a heart attack and now faces imminent death. Weak and barely conscious, Agnès tells Jean that she is worthless, but that she loves him. She tells him that he should forget all about her, but hopefully not condemn her. But now, in a denouement that thwarts Hélène’s malicious plans, Jean swears his undying love for and commitment to Agnès and begs her not to leave this world. Weakly and with her eyes still closed, Agnès smiles and promises that she will stay. This is the closing shot of the film. The style of the film is seductive and shows a different side of Bresson, although it retains many of his cinematic touches. Like his other films, the soundtrack has very crisp, distinctively identifiable sound effects that convey an “interior” sense of the story, as it might be told on reflection or recollection. But, here, the visuals also have this stylized effect. The imposing and glossy presence of the automobiles in the film seem to convey a sense of structure and ritual that goes with the lifestyles of the characters. The repetitive, stylized actions of the principal characters establish their visual signatures, which we come to associate with our understanding of their inner dimensions. For the most part, we don’t see much physical action in Les Dames du Bois de Boulogne: for such a romantic story, for example, it is interesting that there are no real embraces or kisses. The romantic development of the relationship between Jean and Agnès is skipped over, and we cut straight to the wedding. There is one particularly interesting scene, however, at an evening party, at which Agnès is seen dancing with one of her “gentleman” customers. The shot-reverse-shot editing of this sequence is skilled and precise, and it presents an interaction between the two characters that, though still stylized, is dynamic and revealing of Agnès’s character. This kind of dynamic editing was not much followed up in Bresson’s subsequent films, but it represents something that perhaps could have been put to further effective use. Much critical attention has been on the rather mesmerizing image of Maria Casares, in the role of Hélène. Indeed, the Spanish-born Casares, who had already been featured in Marcel Carné’s Children of Paradise (Les Enfants Du Paradis, 1945) and was Albert Camus’s lover, is a fascinating central figure. Only 22 when she played in Les Dames, Casares appears here to be a much older and more experienced woman, always maintaining a civilized but equivocal demeanor. Her reserved, half-smiling expression betrays to the viewers, but not to Jean, her determination for revenge. She went on to star in Jean Cocteau’s Orphée (1950) and to have a distinguished career on the French stage. Interesting though she is, however, one shouldn’t merely focus all one's attention on Casares here. Bresson, who understood the expressive power of the film camera to capture intimate feelings and how inappropriate it often is to portray theatrical staging on film, imposed a highly restrained style on all his actors. 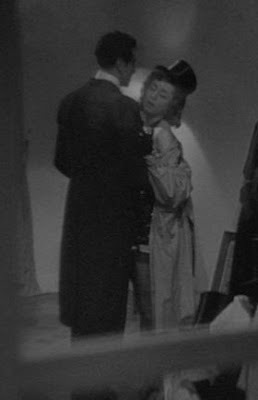 Thus Paul Bernard’s performance as Jean is also very flat and subdued (something that doesn’t play as well for a role of a passionate romantic). Most interesting to me, however, is the performance of Elina Labourdette, as Agnès, which I believe carries the narrative even more compellingly than does the role of Hélène (which doesn’t evolve much past the opening scene). Agnès’s sense of shame, anxiety, and ultimately her complete surrender to love, transform the film from just a nasty story of vindication to a transcendent plane of feeling that would characterise many of Bresson’s subsequent films. When you see this film, watch Agnès struggle (and ultimately succeed) to find her way.